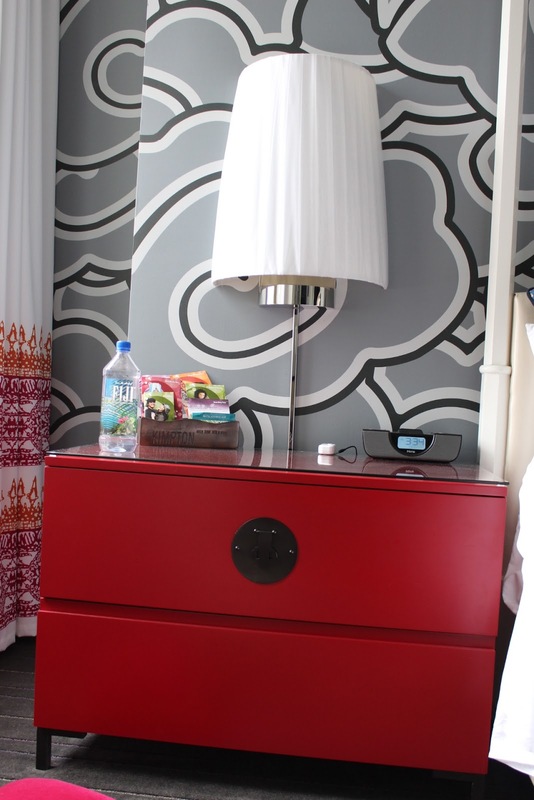 I picked Hotel Monaco Kimpton to stay in Seattle due to being a fan of Kimpton Hotels (we stayed here in NYC) and it seemed to be centrally located. Husband had to come to town for business and I tagged along since I always wanted to visit Seattle (since my teenage grunge days). I had read reviews on TripAdvisor about the thin walls and hearing people next door to you, but we did not have that problem at all. Maybe our neighbors were either really quiet or the rooms around us were empty. Or we're just used to the constant noise around us. When we first walked in to our suite we were surprised by a fish swimming in a round bowl in our living room. We both love all animals so we kept him company, but the second day we started getting worried about the water being too dirty, the fish not getting food since we didn't want any housekeeping service during our stay, and just his overall health. We got some food for him from the front desk and changed his water, but kept wondering if he was ok. So that added a bit of stress having being responsible for the fish. But it was nice coming back to our room and having someone to yell at "hello, I'm home!". Hotel location was great: we were two blocks away from the harbor, 10 min walk to Pike Place Market, 15 mins from Experience Music Project, Space Needle, Museums, 5 min walk from Monorail and Westlake Shopping Center and 20 min Drive from the airport. We rented a car, but didn't use it at all expect when driving to and from the airport and husband used it to get to his office in Redmond. Other times we just walked or took the monorail. Bathroom was spacious and clean, had good counter space, tub/shower combo (I'm so not a fan of those), magnifying mirror, hairdryer and Gilchrist and Soames bath products. Our suite had a king bed that was extremely comfortable. We both slept like babies, but that might have been due to walking oh so much during the day (and not having two big cats sleeping on top of me like normally). We didn't have too much interaction with the staff, but the little we did, everyone was courteous and helpful. We had room service couple of times and their menu was quite nice, found couple of vegetarian items as well. I really like that wallpaper!